Mashuni is a popular breakfast choice in the Maldives. Essentially it is a very simple yet a tasty mix of coconut and tuna. There are many varieties of Mashuni. 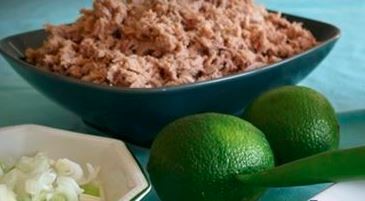 Canned tuna can be substituted with smoked or dried tuna which brings a distinctly different taste to it. (Thin flat bread made of refined flour). Another favorite that goes with Mashuni is the coconut bread, or “Huni roshi”. Most people enjoy a hot cup of sweet Black tea to enjoy the spiciness that comes along with the Maldivian Mashuni. Crumble the tuna chunks and mix in all the ingredients well except the coconut. Lastly toss the grated coconut into the mix.